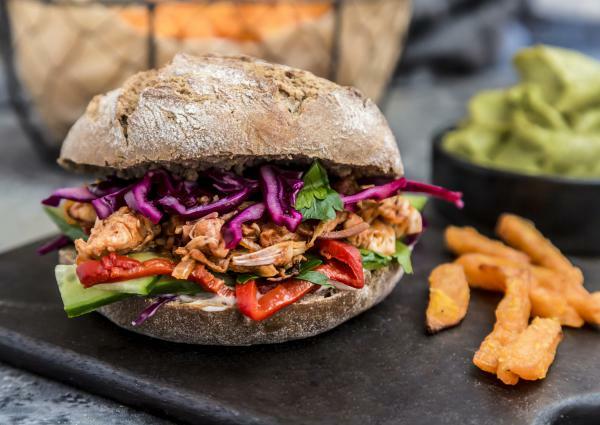 Focusing less on the meat-free or health aspects of plant-based dishes, like this jackfruit burger — and more on their flavor, mouthfeel and provenance — could go a long way toward getting meat lovers to choose these options more often. That's according to research by the World Resources Institute's Better Buying Lab in conjunction with food chains, marketers and behavioral economists. By now, you've likely heard the argument to eat less meat for the health of the planet. Heck, even Beyoncé has been pushing this message, dangling the prospect of free concert tickets for life before fans to raise interest in plant-based eating for the environment. But if you're an omnivore starving while staring at a menu, it can be hard for the future of planet Earth to compete with the appeal of a big, juicy burger. "The language for meat, and beef in particular, just sounds so much more delicious," says Daniel Vennard. And labels like "meat free," "vegan" and "vegetarian" tend to be turnoffs for consumers. "People don't create positive associations with how it's going to taste and don't feel it's very indulgent." And that's a real problem for Vennard. As head of the World Resources Institute's Better Buying Lab, it's his job to work with food companies, behavioral economists and marketing experts to find ways to get people to eat more sustainably. Or, as he puts it, to make "this party sound even better than the other party." The solution, summarized in a new report from the Better Buying Lab, is this: Focus less on the meat-free or health aspects of plant-based foods — which tend to make consumers feel like they're missing out — and more on their flavor, mouthfeel and provenance, so it's "appealing to the inner food critic within all of us," Vennard says. Now, the goal isn't to get everyone to go vegetarian or vegan — just to choose plant-based options more often. That's because red meat production requires a huge amount of water, land and other resources, and it's responsible for a significant amount of greenhouse gas emissions. To find out, the Better Buying Lab teamed up with food companies in the U.K. and U.S., including fast-casual chain Panera Bread. The company had a "vegetarian black bean soup" on the menu that was originally labeled as low fat. Customers who tried the soup seemed to like it, but the name didn't seem to encourage a lot of new customers to try it, says Sara Burnett, Panera's vice president for wellness and food policy.
" 'Vegetarian' — the word in and of itself — to a lot of folks doesn't sound highly craveable," Burnett says. So Panera tried out a couple of options to see if it could make that soup sound more scrumptious. When it rebranded the dish as "Cuban black bean soup" in a test at 18 stores in Los Angeles and California's Central Valley, sales went up 13 percent.
" 'Cuban', in a lot of folks' minds, when they react to that, they think of a flavor profile," says Burnett. "They think of a little bit of heat, a little bit of spice, and that makes people hungry." A test that Better Buying Lab conducted with Sainsbury's, a major supermarket chain in the U.K., had even more dramatic results. When Sainsbury's rebranded its "meat-free sausage and mash" as "Cumberland-spiced veggie sausage and mash" — a name that evokes a traditional British sausage preparation — sales went up by a whopping 76 percent. Vennard points to previous research suggesting that before ordering, diners tend to create simulations in their mind about what they think a meal will taste like. Even so, "the surprise, for me, was how much of an impact language can have on ordering behavior," he says. Panera found its results so convincing, Burnett says, that the company is now doing similar name testing for menu items under development. So don't be surprised to see more words like "Tuscan," "grilled" or "toasted" on Panera menus in the future — "they actually give you a flavor cue," Burnett says. "It's going to be warm, and it's going to be a little crunchy on the outside and gooey on the inside." Now, you'd be forgiven if you think the idea of using language to make food sound tastier seems fairly obvious. "It's Marketing 101," says John Stanton, a professor of food marketing at Saint Joseph's University in Philadelphia. But for a long time, he says, vegetarian- and vegan-food makers have been falling short on this basic concept. "They're targeting it to people who want to avoid meat," Stanton says. But a recent survey shows that only 3 percent of the U.S. population identifies as vegan and only 5 percent as vegetarian. "It's a much bigger market for people who want to engage in delicious." And the demand is there, says Melanie Zanoza Bartelme, a global food analyst with Mintel, a market research and analysis firm. "Consumers are really looking for easy ways to get more 'good-for-them food' — legumes, nuts and seeds and fruits and vegetables — in their diet," Bartelme says. But she says Mintel's research suggests that 50 percent of U.S. consumers say plant-based foods out there "need a greater variety of flavors. So it might be that some of these products haven't yet convinced them that they are worth the switch." Vennard hopes that the strategies that the Better Buying Lab has come up with will help win over more of those consumers. But if that fails? Well, there's always Beyoncé. We know that going meat-free is good for the planet. Still, for those who like steak, eating vegan can be a tough sell. That's largely because vegan and vegetarian foods just don't sound appealing to people who like meat. Companies making plant-based food are realizing they need to woo customers with more innovative products and tantalizing descriptions. NPR's Maria Godoy has more. JUSTIN TIMBERLAKE: (As character, singing) Have you heard about the new health craze? Meatless burger with tofu mayonnaise. MARIA GODOY, BYLINE: Justin Timberlake once dressed up like a piece of tofu in a "Saturday Night Live" sketch. He plays a vegan-food hawker. And he's competing for customers with a sausage vendor by singing his little heart out. TIMBERLAKE: (As character, singing) Veg out. No meat, c'est chic. Veg out. GODOY: In the end, even the sausage vendor is won over. But in real life, plant-based foods can have a bad rap as being, well, boring. DANIEL VENNARD: We're just finding that people don't create positive associations with how it's going to taste and don't feel it's very indulgent. GODOY: That's Daniel Vennard. He's the director of the Better Buying Lab at the World Resources Institute. And it's his job to give plant-based foods a PR makeover. GODOY: ...Because it makes people focus on what they're missing, not what they're getting. VENNARD: We need to make the dishes sound and feel delicious and appetizing, so it's appealing to the inner food critic within all of us. GODOY: For the last few years, Vennard's been working with food companies, behavioral economists and marketing experts. They've been testing whether changing the language on menus and packaging can change consumers' minds about plant-based foods. In one instance, they teamed up with Panera to see if they could boost sales of the restaurant chain's black bean soup. SARA BURNETT: It was originally, you know, labeled as low fat. And it was called vegetarian black bean soup. GODOY: Sara Burnett is Panera's vice president for wellness and food policy. She says the company decided to try out a couple of new names in different markets - the winner, Cuban Black Bean Soup. BURNETT: Cuban really - in a lot of folks' minds, when they react to that, they think of a flavor profile, you know, a little bit of heat, a little bit of spice. And that makes people hungry. GODOY: And it worked. Sales rose by 13 percent. The results were far more dramatic when the Better Buying Lab teamed up with Sainsbury's, a British supermarket chain. They took a dish called veggie sausage and mash. And they renamed it to Cumberland spice sausage and mash, which sounds like a traditional British sausage dish. VENNARD: Which, for my fellow Brits, sounds very appealing. GODOY: Very, very appealing - sales shot up by 76 percent. VENNARD: The surprise for me was how much of an impact language can have on ordering behavior. GODOY: Now, if you're thinking that using language to make food sound tastier seems pretty obvious - ding ding - you're right. JOHN STANTON: It's marketing 101. GODOY: That's John Stanton, a professor of food marketing at St. Joseph's University. He says, for too long, businesses that sell plant-based foods have been failing at this basic concept. STANTON: They sold more on a lifestyle, you know? They sold to vegetarians. And it's a much bigger market of people who want to engage in delicious. GODOY: Ultimately, its consumers who will decide if plant-based foods fit that tasty bill, which the World Resources Institute says would be better for the planet. By its calculations, if everyone on Earth swapped out 30 percent of the red meat they eat in favor of plant-based foods, it could achieve half the greenhouse gas reductions from agriculture needed by 2050. Maria Godoy, NPR News. Transcript provided by NPR, Copyright NPR.